At a time when couples married for money and position, Sarah Jennings and John Churchill married for loveand survived five decades, five monarchs, and countless intrigues of the 17th-century English court. 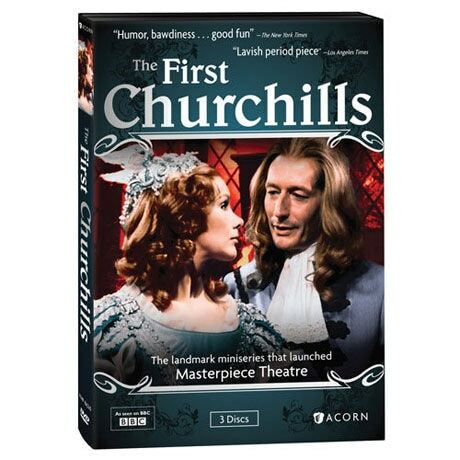 Based on Sir Winston Churchill’s biography of his ancestors, the first Duke and Duchess of Marlborough, this addictive BBC miniseries launched Masterpiece Theatre. Susan Hampshire won an Emmy® for her performance as the tempestuous Sarah. 12 episodes, 9 hrs, 3 DVDs, SDH. When Sarah Jennings meets John Churchill in the court of King Charles II, John has already made his mark on the battlefield-and in the bed of the king's favorite mistress. Young Sarah, a lady-in-waiting to the Duchess of York, is shrewd enough to be wary of John's advances. John's ardent love letters win Sarah's heart, though everyone expects John to marry the wealthy woman his father has chosen. Nothing stands in the way of the match the king has arranged between his niece, Lady Mary, and Holland's Prince William of Orange. Titus Oates spreads lies about a papist plot to kill the king, whipping up anti-Catholic sentiment. Pressure mounts for the king to assure a Protestant succession, but John refuses to join the cabal backing the Duke of Monmouth, the king's illegitimate son. James, the Duke of York, refuses to give up Catholicism, forcing the king to send him into exile. John is ordered to accompany him, and Sarah goes along, mixing with dignitaries in The Hague, Brussels, and Scotland. Princess Anne manages to marry the nobleman she chooses and makes Sarah her Lady of the Bedchamber. Anne and Sarah become so close they devise pet names for each other, Mistress Morley and Mistress Freeman. King Charles succumbs to a sudden illness, and James returns to claim the throne, vowing to maintain the separation of church and state and practice his religion in private. Monmouth declares war on James. As the Churchill family grows, Princess Anne continues to suffer tragic losses. King James fills his court with Catholics and proclaims himself above the law. The queen becomes pregnant-and bears a Catholic heir-but arouses suspicion by calling for a bed warmer during her labor. John switches loyalties. Because King James has fled, Mary claims the throne and makes William her equal as "king for life." James raises an army in Ireland but is pushed back by the English under John's command. Suspicious of John and Sarah's loyalty to Anne, William kicks them out of court. Anne maintains her loyalty to Sarah despite intense pressure from the queen. As James's army advances, John is arrested for high treason. Without John in command, William's army suffers two years of costly defeats against the French. The queen falls gravely ill.
William publicly embraces Anne but privately makes it clear his motives are purely political. Eager to maintain the fragile peace with France, the king also reconciles with John, reinstating him as privy counselor and appointing him to oversee the education of the young Duke of Gloucester. Sarah arranges for her cousin, Abigail, to become an aide to Princess Anne. After a string of victories, John is made Duke of Marlborough by a grateful Queen Anne and given an income to support his new social standing. Sarah and John suffer a crushing personal tragedy, but the next spring John leads the allies to a brilliant victory at Blenheim. Queen Anne rewards John by giving him land at Woodstock and directing that a great palace be built there. Sarah vehemently presses the queen to appoint moderate Whigs to the government to support John. The queen refuses, and the rift in their relationship is adroitly exploited by Sarah's cousin, Abigail Hill. The queen continues to depend on John's military skill but coldly dismisses Sarah. Harley and St. John eventually undermine the ailing queen's trust in John, and she strips him of all his offices. John and Sarah live abroad until Anne's successor, King George I, reinstates them and invites them home to live out their days.